From taxes on pollution to an ocean fund, here are some concrete measures we must take. The ocean provides us with everything we need: food, oxygen, inspiration and jobs. It also regulates the climate. Despite its vital importance, we are currently treating our ocean like an enormous dump. A whole garbage truck’s worth of plastic ends up in the ocean every minute, and we are way overdue in doing something about the problem. The good news is that this is a problem that can be solved. It was a sad but important day when a Cuvier's beaked whale was beached on Sotra in Norway with 30 plastic bags in its stomach. Those of us who have been working on ocean issues for some years know that this is not a new problem. Plastic pollution in the ocean was documented by researchers as far back as 1970. For everyone else, 2017 was probably the year when their eyes were seriously opened. The plastic problem is now so huge that it can be observed on beaches in all corners of the world. Every year, an estimated 8 million tons of plastic end up in the ocean. A product that was once lauded as a stroke of genius has become one of the fastest growing environmental problems in the world. It can be hard to imagine how much 8 million tons actually is. To put it in perspective, it’s roughly equal to the weight of the entire population of Spain and the United Kingdom. The figure is estimated to rise to 60 tons per minute by 2050 if today's plastic use and lack of adequate waste management continues. The plastic creates big problems for wildlife and for humans. Birds, turtles and other ocean creatures become ensnared in carrier bags, stuck in abandoned fishing gear and die with their bellies full of plastics. The plastic enters the food chain and the food we eat, and has been found in pretty much all species of fish examined, along with mussels and snow crabs. This is probably just the beginning. The plastic problem is enormous, but it can be solved – and it is urgent that we take steps now to do so. We use an incredible quantity of single-use plastic items, such as straws, plastic bags, packaging, plastic cups, plates and cutlery. We must put an end to it. An increasing number of countries have now imposed a ban on disposable plastics and plastic bags, or established concrete targets for reducing plastic consumption and waste. This effort must be scaled up, so that global plastic consumption goes down. You can do your part by refusing to use these products. Over the past 50 years, world plastic production has doubled, and leading plastic manufacturers are planning to increase production by almost a third over the next five years. In 1974, the average per capita plastic consumption was 2kg. Today, this has increased to 43kg! This is taking the world in the wrong direction. Instead, alternatives to non-degradable plastics must be developed, and the industries responsible for the major plastic wastes must be targeted with specific industry agreements and producer liability arrangements, with requirements for handling, collection and reuse of waste and broken plastic equipment. A member of Algeria's Under the Sea diving club collects plastic bottles. 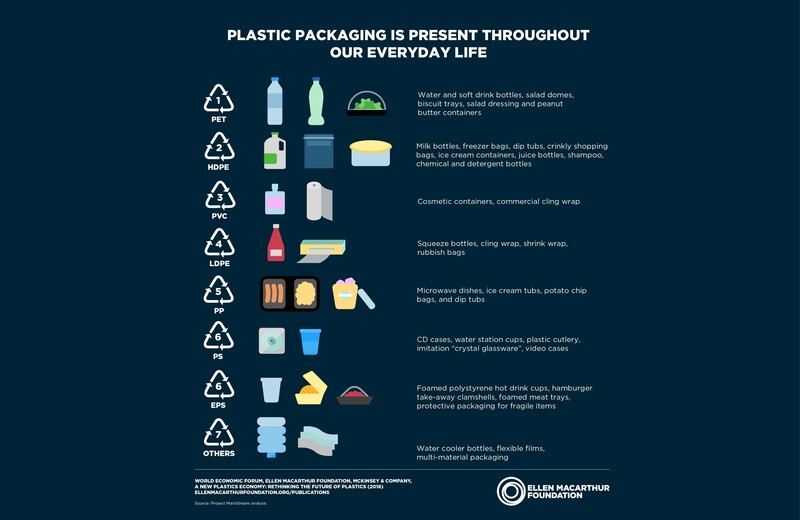 Most of the plastics used today are produced from oil, and are a source of both climate emissions and pollution. As an example, in Norway only 0.5 percent of the plastic is renewable. Despite that, fossil plastic is still cheaper to make and buy than the renewable. 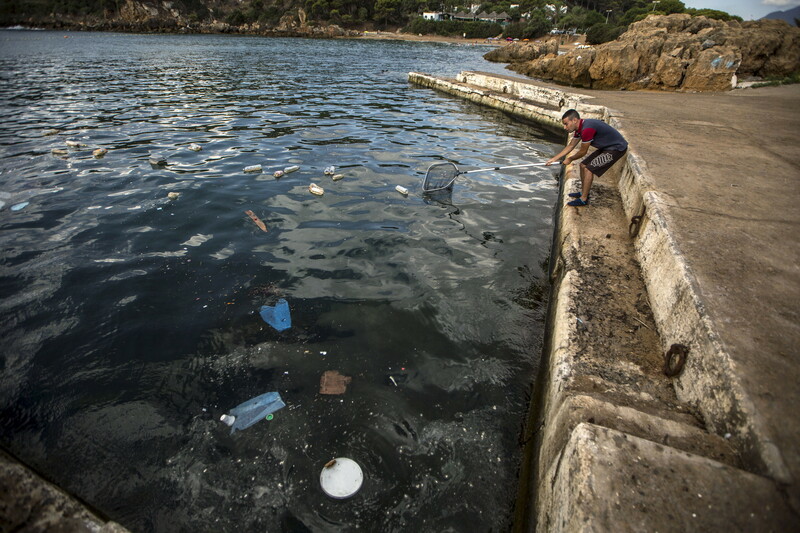 Governments need to investigate implementing a tax or fee on polluting plastics. The fees must be changed so that recycled plastic becomes cheaper than fossil. The bulk of plastic waste comes from developing countries. Rapid population growth and a swelling middle class means the consumption of plastic is increasing faster than the capacity to handle the plastic waste, and therefore much of the excess ends up in the sea. China and Indonesia are among the countries that produce the most plastic waste. As part of the solution, an international aid programme should be established to develop waste management and recycling infrastructure. In December 2017, the UN Environment Assembly adopted a global goal to stop the discharge of plastic to the sea. As a follow-up, an international agreement with firm targets and time frames for implementation should be established, ensuring the mapping of sources of marine waste, increased market responsibility to prevent new propagation and strengthening of waste management globally. There is still much we do not know about the plastic problem. Researchers estimate that more than 70 percent of the plastic ends up on the sea floor. Over time, it breaks down into tiny particles, but we do not know what happens to this material or how to get rid of it. The efforts to map and monitor, as well as conduct research on the negative effects, must be strengthened. An important initiative in this direction is REV, the world's largest research and expedition vessel, which aims to solve the biggest challenges around the ocean, including a dedicated effort on plastic. Around 80 percent of the plastic in the ocean is suspected to come from activities and industry on land. This can include everything from car tyres, technical sports equipment and fleece clothing, to cigarette butts and cotton buds. Everyone can and should contribute to the solution. For example, you can participate in clean-up operations, cut your own plastic consumption and of course always pick up any garbage you find along your way. To solve the plastic problem, we must ensure that action and clean-up operations are undertaken in areas where the problem is the greatest. Much of the work, however, is hampered due to the lack of financial resources. By establishing a global ocean fund, with waste management and clean-up of marine areas high on the agenda, we will be one step closer towards the goal: a future without plastic and marine pollution in our ocean.